La Bandita Townhouse is set amidst the cobblestoned streets of Pienza (Tuscany), a jewel of a Renaissance town near Montepulciano. Until it opened, there were few luxury boutique hotels in the town. La Bandita Townhouse could be the backdrop for an epic Hollywood romance or a heartbreaking period piece. And, really, that’s because Tuscany has been where “The English Patient,” “Gladiator,” and “Under the Tuscan Sun” have been filmed. The building has been a convent for more than 500 years and has been converted into a 12-room luxury hotel. Rooms feature wood beams on the ceiling, beautiful light fixtures, large windows and stone walls. Through the windows, you can gaze at Montepulciano, Montefollonico or Monte Amiata. There is a free minibar, laundry service, free parking and bike rentals. You can spend your time in the library (if the weather is foul) or in the walled garden. Rates range from 195 euros a night during low season to 695 euros during high season. La Bandita has a restaurant and wine bar called The Townhouse Caffe, where guests can savour Tuscan classics made with local seasonal ingredients. And while the directions may seem daunting, (think confusing roads and questionably marked signs) the trip to La Bandita Townhouse and Pienza is definitely worth the trouble. Pienza has not suffered as much from the tourist invasion as other towns in Tuscany. You could spend an entire afternoon wandering the atmospheric narrow streets that lead to small squares and admire Renaissance churches and palaces. Pienza was one of the first towns to undergo “urban planning” based upon humanist Renaissance concepts. Enea Silvio Piccolomini, one of the richest men in the area (and who later became Pope Pius II) hired architect Bernardo Rossellino to transform what was then a village called Corsignano into the ideal Renaissance town designed around the principles of humanism. Piccolomini built himself a grand palace, which he used as a summer residence when he was Pope). 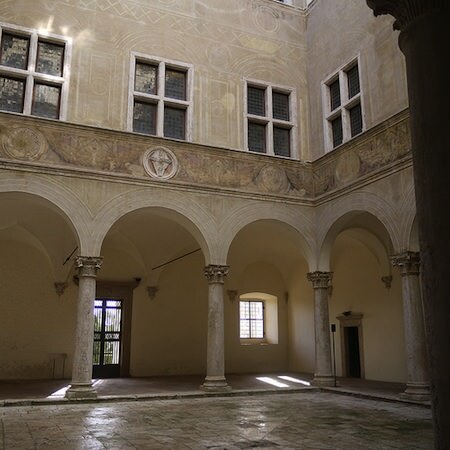 The Palazzo Piccolomini is open to the public. Piccolomini encouraged other cardinals to build palaces in Pienza, many of which are still standing today. Other notable historic monuments include the Duomo (Cattedrale dell’Assunta), the Town Hall and the square. In the late 1990s, Pienza was designated a UNESCO World Heritage site. Brittany Trevick is a writer, editor and travel enthusiast who is based in Minneapolis, Minnesota.